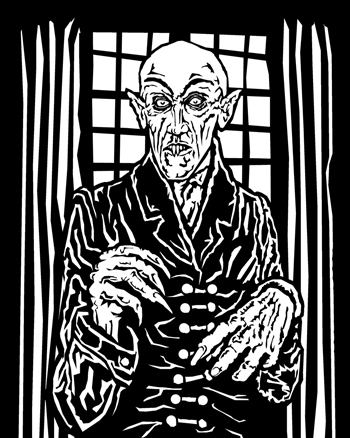 "At the end of the corridor, framed by an arch, stood a tall, hunched nosferatu in a long shabby frock coat. His head was swollen and rodent-like with huge pointed ears and prominent front fangs. His eyes, set in black caverns that obscured his cheeks, were constantly liquid, darting here and there. Even his fellow elders found Graf Orlock a disquieting prescence."